The basis for a major documentary, two leading experts sound an urgent call for the radical reimagining of American education so we can equip students for the realities of the twenty-first-century economy. “If you read one book about education this decade, make it this one” (Adam Braun, bestselling author and founder of Pencils of Promise). Today more than ever, we prize academic achievement, pressuring our children to get into the “right” colleges, have the highest GPAs, and pursue advanced degrees. But while students may graduate with credentials, by and large they lack the competencies needed to be thoughtful, engaged citizens and to get good jobs in our rapidly evolving economy. Our school system was engineered a century ago to produce a workforce for a world that no longer exists. Alarmingly, our methods of schooling crush the creativity and initiative young people really need to thrive in the twenty-first century. Most Likely to Succeed presents a new vision of American education, one that puts wonder, creativity, and initiative at the very heart of the learning process and prepares students for today’s economy. “In this excellent book...Wagner and Dintersmith argue...that success and happiness will depend increasingly on having the ability to innovate” (Chicago Tribune), and this crucial guide offers policymakers and opinion leaders a roadmap for getting the best for our future entrepreneurs. Ted Dintersmith is a partner emeritus with Charles River Ventures, a leading early-stage venture capital firm. Ted has twenty-five years of venture experience, focusing on software, information services, direct- and web-based marketing, and publishing companies. He is a frequent speaker at conferences on innovation and entrepreneurship. "Bracing, revelatory, and always backed up with hard facts, Most Likely to Succeed should top the reading list for any teacher, parent, citizen, or high school or college student. 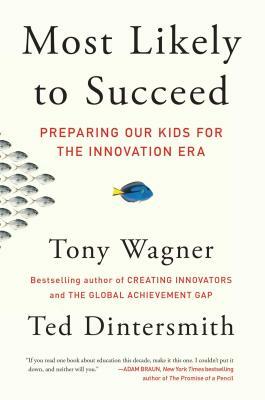 Wagner and Dintersmith's incisive prose slices through the politics to show—without pointing fingers—how schools can refocus to prepare our children for the jobs of the future." — Laszlo Bock, SVP of People at Google and author of WORK RULES! "This is an urgently needed and inspiring book, with two authors who have the first-hand experience to blueprint a bridge from the schools we have to the future we need." — Sir Ken Robinson PhD, author of "Creative Schools: The Grassroots Revolution That's Transforming Education"
"If you read one book about education this decade, make it this one. I couldn't put it down, and neither will you."